Objective Precise liver segmentation is necessary in the computer-aided diagnosis and surgical planning of liver disease. However, liver segmentation remains challenging in medical image processing task due to the complexity of the liver anatomy and low contrast and morbidity of neighboring organs. 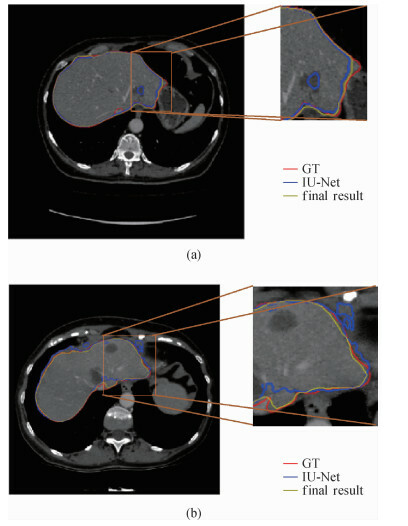 To solve the problem of the fuzzy boundary of abdominal image organs and low accuracy of traditional U-Net model in end-to-end segmentation, this study presents an enhanced CT liver segmentation method based on improved U-Net and Morphsnakes algorithm. Method First, we proposed a method for medical image preprocessing. Medical image is different from natural image. The CT images we obtained from a hospital cannot be used directly because the original format of CT images is not rectangular. Pixel padding value (0028, 0120) is used to pad grayscale images (those with a photometric interpretation of MONOCHROME1 or MONOCHROME2) to rectangular format. The first step of image preprocessing is to set the pixel padding value to 0. The second step is converting pixel values to CT values. We then used the processed images to create a dataset. Thereafter, IU-Net is trained with the constructed dataset. IU-Net is a U-Net-like convolution neural network that can achieve end-to-end segmentation. IU-Net contains two paths:downsample path to extract features from images and upsample path to resume image resolution. Between these two paths, the skip connections that can provide additional features for upsample path are available. IU-Net is deeper than U-Net but with less skip connections. While training segmentation neural network, only seeing the loss is insufficient. Often, the loss has good performance, but the segmentation accuracy is low. Therefore, IU-Net has an additional dice layer to evaluate segmentation accuracy during the training epoch. When training loss is stable at low levels, and dice accuracy is stable at high levels, training ends. Finally, OpenCV and Morphsnakes are used to refine the segmentation results generated by IU-Net. OpenCV is used to fill the hole and remove the redundant part of the segmented liver. Morphsnakes is a morphological approach to contour evolution on the basis of a new curvature morphological operator valid for surfaces of any dimension. Morphsnakes approximates the numerical solution of the curve evolution PDE by the successive application of a set of morphological operators defined on a binary level set and with equivalent infinitesimal behavior. The binary segmentation mask optimized by OpenCV also serves as the binary level set. Through the processing of Morphsnakes, we obtained the final segmentation mask and liver contour. In this study, we trained IU-Net, U-Net, and FCN-8s, and all of them were trained in two kinds of processed data. One kind of data is Hounsfield windows, which we used to set the CT value to[-100, 400]. The other one has nothing to do with CT value. IU-Net and U-Net were both trained from scratch. FCN-8s was trained using a fine-tuning strategy, because this strategy did not merge when we trained FCN-8s from scratch. We also compared the performance of rectified linear units and parametric rectified linear units on IU-Net. Result The experimental data include 200 sets of enhanced CT, 160 sets for training, and 40 sets for testing. The segmentation accuracy of our proposed method is 94.8%, which is better than that of the U-Net and FCN-8s models. Fine-tuning can make neural network training easy because it takes an already learned model and adapts the architecture. When building a neural network model completely different from a previous one, fine-tuning is no longer useful. 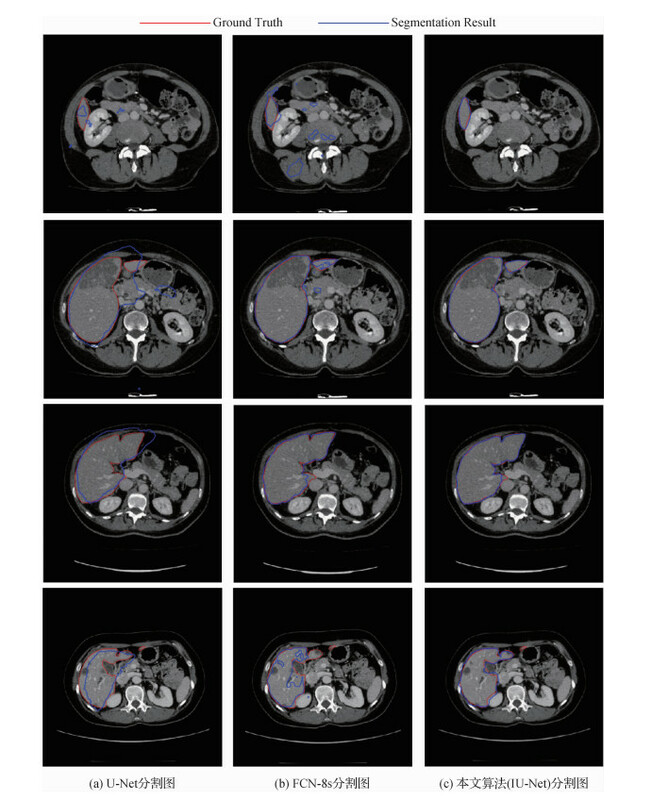 Conclusion Our proposed method can accurately segment liver from enhanced CT images in various shapes and provide a reliable basis for clinical diagnosis. Heimann T, Meinzer H P, Wolf I. A statistical deformable model for the segmentation of liver CT volumes[C]//MICCAI Workshop 3D Segmentation Clinic: A Grand Challenge. Brisbane: MICCAI, 2007: 161-166. Kainmüller D, Lange T, Lamecker H. Shape constrained automatic segmentation of the liver based on a heuristic intensity model[C]//MICCAI Workshop 3D Segmentation Clinic: A Grand Challenge. Brisbane: MICCAI, 2007: 109-116. Simonyan K, Zisserman A. Very deep convolutional networks for large-scale image recognition[C]//International Conference on Learning Representations, 2015. Glorot X, Bordes A, Bengio Y. Deep sparse rectifier neural networks[C]//Proceedings of the 14th International Conference on Artificial Intelligence and Statistics. Fort Lauderdale: PMLR, 2011: 315-323.